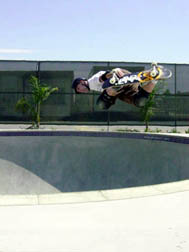 This pool is super smooth with perfect coping. It has a 10' deep egg bowl connected to a 7' deep square bowl. This thing is so good that I'm thinking about buying another van and living in the parking lot!!!!!! 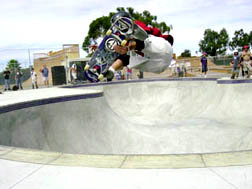 Cab with a sweet smith grind. 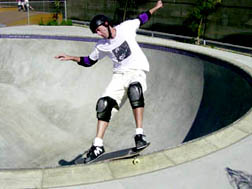 Pa. brother Keith Lenharr with a smith grind. 42yrs young! 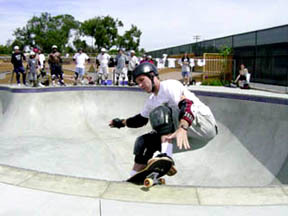 Jim Tesnar with a frontside rock. 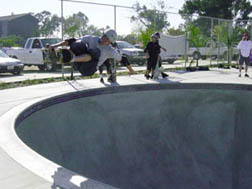 The elusive Neil Blender with a smith grind in the shallow end. 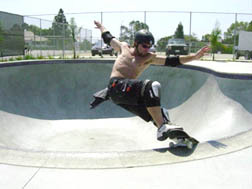 Mike Stefaun smithgrinding the shallow end.